How can you organise your summer clothes? Where did you store your picture albums? Have you simply run out of storage space? Sofia has extensive experience as marketing manager in a wide variety of multinational companies. She has lived and worked in the USA, France and Spain and is an enthusiastic traveller, always eager to discover different peoples and cultures. Lola’s career has revolved around people in a broad array of areas including commercial management, event organisation and public relations. 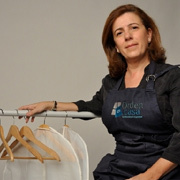 She is a mother of two with fantastic communication skills and a great talent for order.